Having a hard time deciding which commercial roofing company to hire? Miller’s Home Improvement is your best choice in Michigan. We’re a local, insured, and licensed contractor. It doesn’t matter if you want a new modified bitumen flat roof, another roofing system, or get your current one repaired. What you should be sure of is that your next contractor does it with your best interests in mind. Inspections – Our team determines your roofing structure. This allows us to assess the level of damage. We’ll check if it can readily accommodate a new material. We inspect not only the rooftop but also the interior roofing system. Get our total inspections for free.. 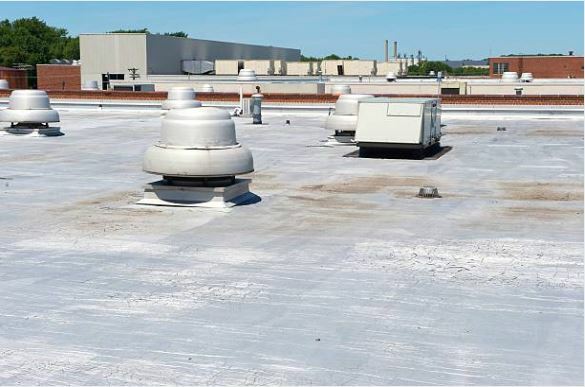 Repairs – Leaks, blisters, standing water, punctures… These RED FLAGS tell you that your commercial roofing needs attention. If you notice moisture damage within your building and usually high energy bills, please call us! We use specific methods to repair your roof depending on the type and size of the problem. New Installations and Replacements – Looking to build a physical business? We’ll help you choose the best material that suits your roof. To date, we install TPO, EPDM, and Torch-Down roofing. When it’s time to replace your roof, we also do tear-offs but again, inspect it thoroughly first. Some building owners vote for the best materials. Some prioritize hiring the right contractor. True, great results happen when you bring in a knowledgeable, certified, and experienced team. We establish close partnerships with leading brands to bring you durable commercial roofing systems. Our materials come with good warranties. This ensures that your roofing installation and repair are completed with zero errors. A building owner has unique needs and requests. Every step of the way, we’ll keep you informed and be always ready to listen to your concerns. Hire your next commercial roofing contractor at Miller’s Home Improvement. Get your free quote and schedule an inspection today. Call our office at 248-242-0820.